Attractions in Nusa Dua is a view of the sea and beaches with white sand and coral clusters with big waves in some places, a spray of water look very real in this area. Water Blow is a blast of sea water from the ocean waves hitting the rocks, so that the water rises up, as a result of sea waves hit against a cluster of rocks on the beach. This effect makes sea water gushed up that eventually fell like rain. 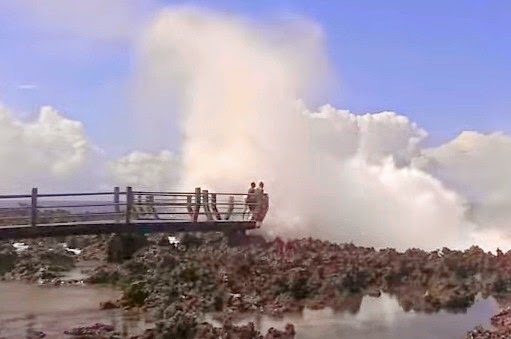 Water Blow is now a tourist attraction that is highly sought after by tourists visiting Nusa Dua. Previously, people are not familiar with Water Blow in Nusa Dua. This effect can only be seen from afar. 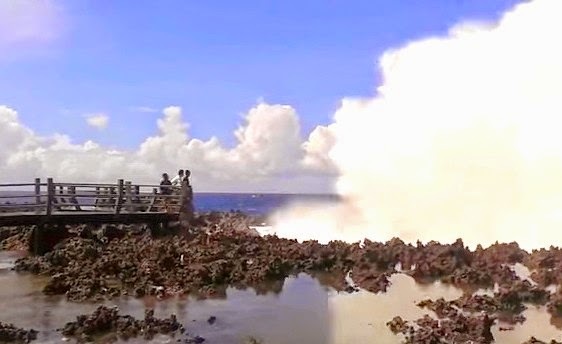 However, because many foreign tourists who like the Water Blow, the Nusa Dua area managers make the road to get to the cluster of rocks, so that visitors can more closely sensation of Water Blow. Visit this attraction is free of charge. It's just that every person who entered the area of Water Blow, will be considered and monitored by local security officers. Because this attraction is very dangerous, and can cause the victim if the traveler does not heed the warning attached to this attraction. By late afternoon, attraction of Water Blow very much visited by local residents. Not only to enjoy the natural beauty around Nusa Dua, also while exercising and jogging. Nuance very quiet and clean, with pandanus trees, making the atmosphere more enjoyable exercise. Attractions of Water Blow closed when the night begins. Therefore, this attraction is very dangerous at night. No lights illuminate around the rocks. So it can be disastrous for the visitors. In addition, because the area is very quiet and Water Blow lots of bushes, it is feared, if the attraction is open until late at night, it will be a nasty place by a young couple who are dating. Flashes of water that hit the rocks, like a demon water that gushed from the sea. If you feel yourself crazy, can try the thrilling sensation of water bursts. Vigilance and always highly advisable to be careful when sensation Water Blow in Nusa Dua, Bali.